Sometimes really smart people do stupid things. They do things like dismiss a prospect entirely based on his age or his height. That's dumb. Yes, your age at a given level is an indication of a player's talent and skill level but it isn't everything. And at least in baseball, size doesn't matter. Matt Young is 26-years old and short. He is a very good prospect. Young was a fantastic High School Player for Plano East High School where he made the All-Texas Team. At the University of New Mexico he was a Freshman All-American. He led the Mid-West Conference in walks and On-Base Percentage. His sophomore year he led the conference in walks and steals. His junior year he hit .381 and led the MWC in triples. He went undrafted but signed as a free agent with the Braves. With the Rome Braves in 2005 he hit .312/.412/.409 with 85 runs and he had a .992 fielding percentage in center field. He led the Braves organization in OBP and runs scored. In 2006 with Myrtle Beach he hit .281/.389/.375 with 30 doubles and 71 walks, while playing excellent defense and stealing 21 bases. In 2007 he missed time due to injuries but still had a .381 on-base percentage for the Pelicans. He was promoted to double-A and struggled for the first time in his life batting .242/.308/.305 in 33 games. In 2008 repeating double-A he hit .289/.384/.385 with 30 stolen bases. 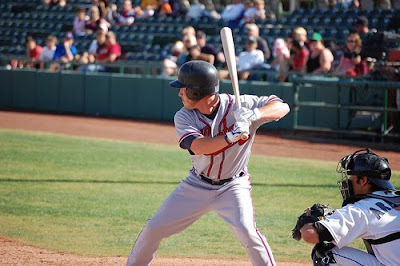 Last fall the Braves sent Young to the Arizona Fall League, a prospect showcase and he sparkled hitting .367/.426/.571. But for some reason the Braves sent him back to double-A Mississippi where he is presently hitting .281/.409/.393 with 33 stolen bases in 427 at-bats. Young looks like another Nyjer Morgan (maybe not quite as good the base stealer --more on him later). Remember last weekk when we discussed the way teams are going to change? Young is a perfect example of the type of player that will be receiving more chances in the majors than in past years. The Braves haven't shown many signs of including him in their plans (I believe he'll be Rule V eligible) but he should be on the radar of fantasy owners as a potential steal source. Tom Verducci of Sports Illustrated is suggesting that Major League Baseball is almost certain to have a slotting system for Amateur Draft picks in place by the 2012 draft. This is a great idea. MLB should model their plan after the NBA's and eliminate arbitration altogether. It seems to me that the problem with baseball's present system is not so much that the Free Agents demand so much money. The true problem is that the arbitration eligible players demand so much and and often are not worth it. But under the present rules teams are screwed if they don't offer arbitration. Should the Twins have to pay Delmon Young $3-4 million dollars next year to keep him around? No, but they will because it would be far worse to let him go for nothing before they even managed to squeeze a good season out of him. This is why the NBA's restricted free agent process is so much better. The player can still get a huge payday if he's worth it (as Tim Lincecum absolutely is) but guys like Young (and the dozens just like him) get the raise without the ridiculous demands attached. Tyler Hissey of MVN's Around the Majors blog has put together some rankings of this winter's class of free agent pitchers. He has three different lists but here's the FIP rankings. Check out the Around the Majors blog for the others. Plus some undefined changes to the bullpen...Is this the best he can do? I bet everyone reading this can do better without adding more than $30 million to their $102 million dollar payroll. Use Cot's Baseball Contracts if you'd like to show me how much better you can do...(yes, hint, hint). The Chicago Cubs have finally been sold. After years of rumors and at least two years of negotiations the Cubs (or 95 percent of them) are now the property of the Ricketts family for a cool $845 million. Hopefully, this will free the Cubs to do whatever it takes to finally return to the World Series and even to win one. The Cubs were severely hampered by this process in Spring Training when they attempted to acquire Jake Peavy or another top starter. The Cubs should make big moves this fall. Who says the Mets don't have any prospects? He came into the spotlight this week when he made Baseball America's Prospect Hot Sheet, but Kirk Nieuwenhuis is not just the flavor of the week. He was a third round pick in 2008 and just had his 22nd birthday. He'll be moving quickly through the Mets organization if this keeps up. This week's hot sheet also includes my second favorite prospect ( after Michael Stanton), Brett Wallace. Check out the write ups on the whole list which is not behind the subscriber wall. Early this season I was a doubter when it came to Nyjer Morgan. I was not discounting his ability to play good defense and steal bases. I just did not think the Pittsburgh Pirates were the type of team to allow an older player like Morgan a full-time opportunity. I thought they would lean on their younger players even if it hurt a little. I should have known better. But I am now as big a Nyjer Morgan fan as there is. I love to see that guys like Thomas Boswell of the Washington Post are also on the bandwagon. The Washington Nationals are quickly becoming my second favorite team. Now that Mike Rizzo is the GM I'm confident that they will continue to make all the right moves. They are closer than you think to being a contender. They have the key parts of a quality offense. If you can't find a way to score runs with a speedster with on-base skills like Nyjer Morgan, an on-base machine like Nick Johnson (I know he's gone but still...) and middle of the order bats like Ryan Zimmerman, Adam Dunn (who should be moving to first base next season), and Josh Willingham you should be fired. Just ask Manny Acta. Rizzo will keep building up the farm system. This time next season Stephen Strasburg should be the best pitching prospect in the country (if he isn't already) and about to join the Nationals' rotation (if he isn't already there). I enjoyed reading how the Nationals led by Mike Rizzo out-maneuvered super agent Scott Boras. The stories are probably overblown but Strasburg apparently always intended to sign provided he received a fair offer. So when the Nats discovered this and stuck to their record breaking (but far from the 25-50 million Boras was supposedly looking for) offer, and given his client's wishes, Boras had to accept it. Strasburg is far from flawless but he is deserving of the attention he is receiving. Despite the hype you can count on the Nationals doing the right thing. They'll keep Strasburg in the minors where he belongs until he proves himself. Do not expect to see him in the majors before mid-June, if even that soon. This is a great site that you have here. I have a sports site myself where everyone can debate freely on controversial sports issues. I was wondering if we could possibly do a link exchange. Let me know if this is possible. Does B.J. Upton Deserve Another Chance? Roundtable: Does Your Trade Pitch Work?